Past week it has been freezing and nasty in Montreal. Especially last Wednesday the cold was bone chilling and the strong wind did not help. I have a remedy for keeping at least your hands warm, though. 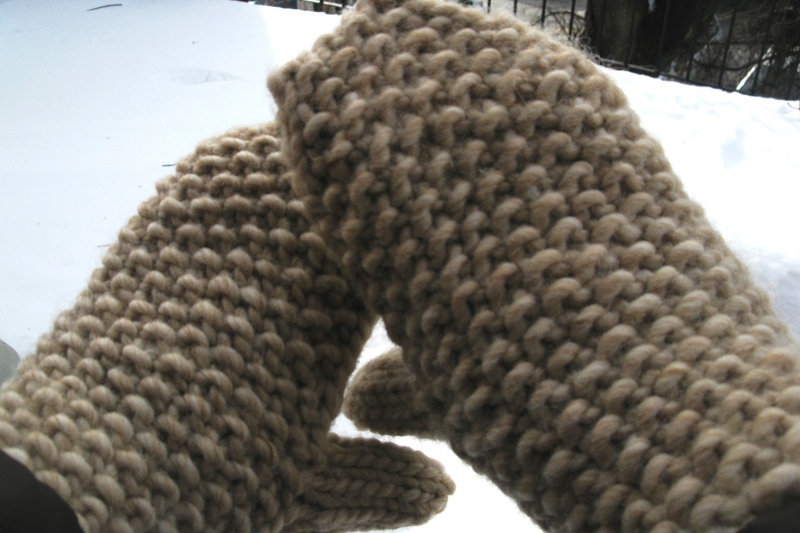 Knit on 8 mm (US size 11) needles to get a dense fabric with a super bulky yarn these mitts are sure to keep your digits cozy – even at -18 Centigrade with a wind chill of -26. 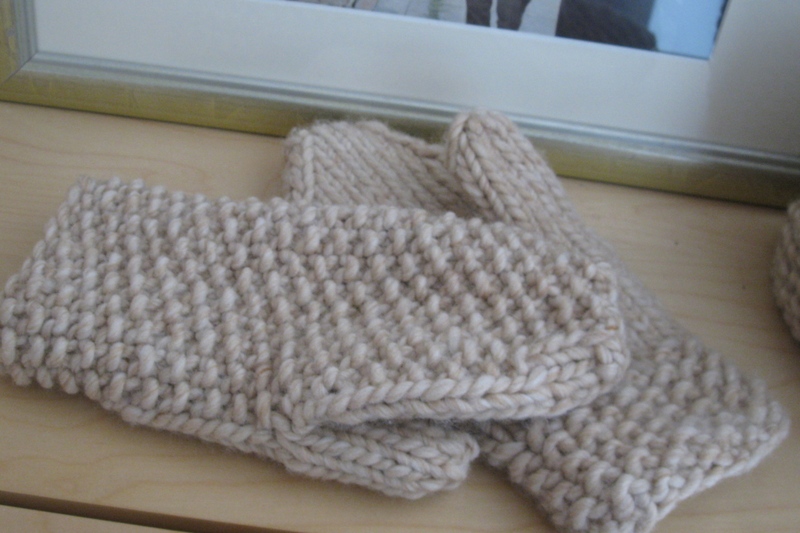 I had much fun making these up, especially since large needles and big yarn make a quick project of both! Your hat is cute, but there is an error in the cast on. The pattern says “cast on 19 stitches”…whoa…wrong! I believe it should read cast on 49 sts. Is that right? Big difference!! Thank you, Carol Ann, for pointing out this mistake! You want to cast on 49 sts, of course. I have uploaded the corrected pdf. I know it’s 4 years after you posted this pattern, but I hope you’re still monitoring the questions 🙂 I have a question about the gauge: the pattern for the super cute mittens says “10 stitches to 17 rows in Stockinette Stitch” – what should that equal? 4 ” ? Something else? Indeed, 10 sts for 4″. Sorry about this omission, I really need to fix that! Dear Mona. Hi ! I am a “return to knitting from taking years off of raising 5 children knitter! !”, anyway, I have some leftover buffalo wool yarn from a coat I made I started 40+ years ago. Are you familiar with that yarn? I’d like to use it for these mittens. Do I just be brave and try to figure out what size needles to use? 🙂 I don’t know what weight it would be called. There are like 6 fibres if I sort of pull each one apart. would you call that 6 bulky then? It would be about impossible to separate them without driving myself crazy. Do you have a suggestion to what size to start with? Thanks Mona I’m having a blast getting slowly back into this wonderful hobby!!! I learned to knit at 9 years of age. Now at 65 I’m enjoying the grandmotherly of it!!! The color of the buffalo wool I have is cream. I used up the other two colors. Also, I don’t know how much I have? 1 largeish skein and a little bit extra. Is there a correct way to weigh it ? Bless you and thank you!! 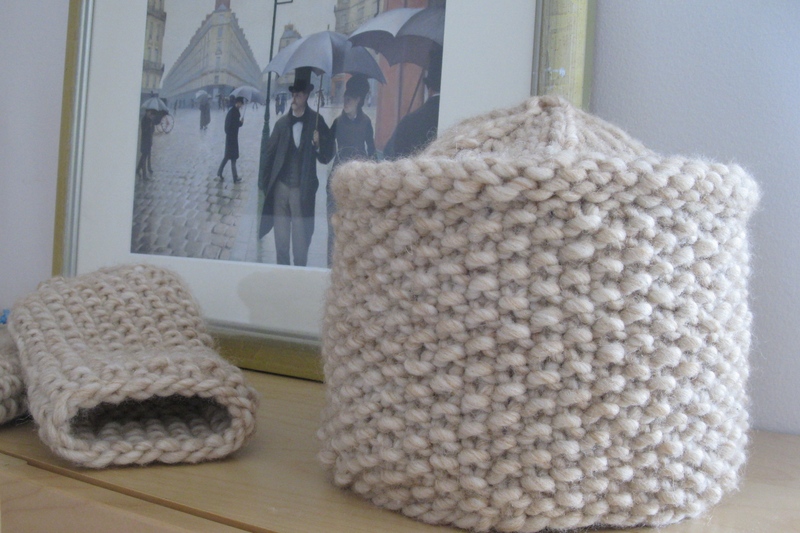 I know the yarn you are talking about – I have used the 3ply Buffalo wool myself before. I think this will work! I am not sure about the yardage in the 6ply, but if you have a full skein, that should do. You won’t know until you try!